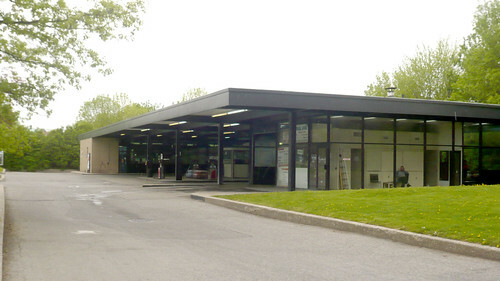 Mies gas station, originally uploaded by zadcat. Alright, I know where I’m going to put my decommissioned Skyway: right next to my decommissioned Mies van der Rohe Esso Station. The building is on a corner, and is long and low and mostly a void. The most prominent feature, the black steel awning over the pumps, runs between a glass & buff brick box on one end [the store] and a glass & steel box on the other [the garage and office]. Looking at flickr member zadcat’s photos up close, the gas station looks mostly stock; there’s none of the material preciousness of, say, IIT’s custom profile I-beams, and forget about the Barcelona Pavilion’s meticulously matched marble, travertine, and onyx. This is a utilitarian building created by a mature architect’s office which, for better and worse, knew its way around the construction industry. Tucked away on the far, quieter side of an already quiet residential island, the old school Esso station lost business to a newer, more amenity-filled competitor near the bridge, and it was recently closed. Now a debate is on about what to do with the property. Toronto’s Globe & Mail reports that public hearings on the fate of the defunct building, now owned by some developer, were set for this week. There’s talk of a flower market which might leave the building pretty much as is, or maybe they make it into a youth center, which means destroying it by remodeling it. 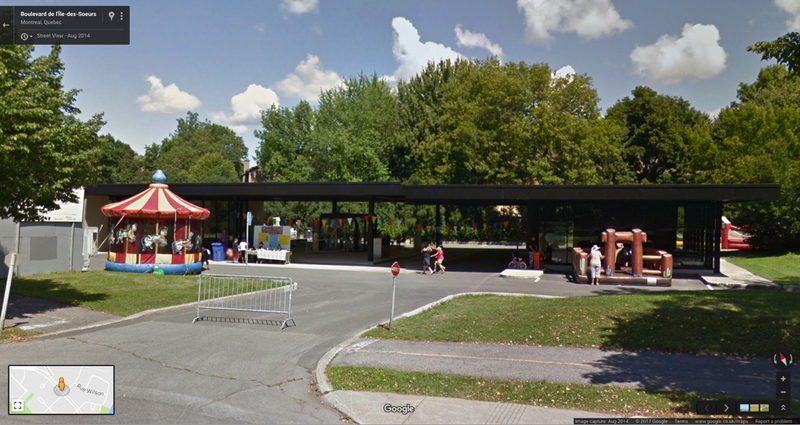 The option that wasn’t mentioned in the paper–perhaps because the city peres in Montreal were graciously waiting for me to proffer it–is to let me have the building in exchange for dismantling it and removing it to a new site so I can live in it. It’s already clear that even though it is his only gas station, its timing, and the process under which it was designed mean it is not a super-important example of Mies’s work. In other words, Montreal shouldn’t get too worked up about it. And that same standard issue construction quality means you don’t necessarily need to sweat wrapping and numbering every brick and plate of glass. Practically speaking, dismantling, moving, and rebuilding offers the aspiring gas station dweller like myself the best of all possible worlds: the sleek, authentic industrial architecture and space, in the ideal setting of your choice, with absolutely none of the environmental toxicity complications of the original site. The fact that you’re preserving and breathing new life into the work of a master of 20th century architecture is pure bonus. But it’s the bonus that makes the whole concept possible. No run of the mill gas station is worth the irrational expense and hassle of dismantling, conservation, and reassembly. And while it’d be arguably cheaper and more practical, building a house from scratch that is a replica of a Mies van der Rohe gas station just seems sad and pathetic to me, like making yourself an exact copy of Southfork. No, saving a Miesian landmark provides the necessary conceptual cover to make an otherwise crazy plan seem rational, even imperative. And then the Skyway can be my office and editing suite right next door. Previous Previous post: Rose C’est La Vie?